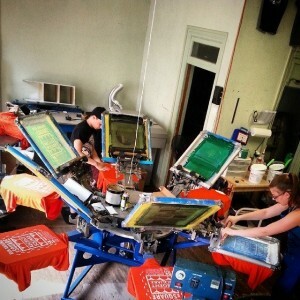 We have been printing t-shirts for races, clubs, special events, festivals, sports teams and more for over two years. Our state-of-the-art screen printing equipment ensures phenomenal print quality, and quick turn around time for any size t-shirt order. We like to stay up to date on the latest trends in the decorating industry and attend many industry specific tradeshows. To get your project started, feel free to stop by our showroom located at 140 West Fourth St, Williamsport, PA 17701.